Cankarjev dom – Cultural and Congress Centre is exhibiting work of Slovenian photojournalist, Srdjan Živulović, who in 2016 became the first Slovenian receiving the Pulitzer Prize. Photojournalist Srdjan Živulovič became in 2016 the first Slovenian receiving the Pulitzer Prize. The photographer, working for the Reuters Agency for 25 years, was awarded the prestigious award as a part of the photography staff of Thomson Reuters which won the US journalism award along with their colleagues from the New York Times for pictures of the European refugee crisis. Živulović’s winning shot shows a group of refugees making their way to Europe on the outskirts of Brežice, near the Slovenian border with Croatia. The Cankarjev dom – Cultural and Congress Centre’s exhibition in Mala galerija (Small Gallery), on display from the 10th of October until 18th of November, consists of Živulović’s series of photographs titled Black Gold (Črno zlato). 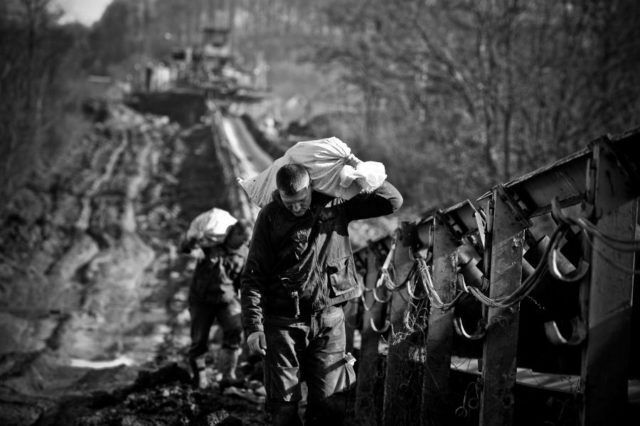 The series was created by accident when Živulović, as a professional photojournalist in Tuzla (Bosnia and Herzegovina) accompanied workers’ demonstrations in February 2014. Next to this theme, he discovered another one which revealed the daily effort of the unemployed and impoverished residents around the Đurđevik coal mine who were collecting coal leftovers to earn a bit of extra profit. Živulović created an extremely human-experienced photojournalist testimony through an impressive series of reporter-style photographs, with journalistic skills and haste, yet with deep message values. Živulović revealed lives of the unemployed former miners and their relatives, women, and children with a varied, and above all, highly confidential series of black and white shots that were created live and without special preparations and effects. Ljubljana’s Cankarjev dom, an arts and convention centre with a distinguished artistic tradition, offers a unique mixture of arts and cultural events to its congress and business guests. This relation between arts/culture and meetings industry results in the fact that diverse meetings, ranging from business to science, are all the more inspirational in a venue that hosts a rich programme of artistic events. The Black Gold exhibition, thus, represents another addition to the CD’s exceptionality among Slovenian congress institutions: the CD is, with the selection of cultural programmes, providing an added value to any meeting held inside the CD; business guests can attend the cultural events as a part of their activities between or after the meetings, or, in the case of Živulović’s photography, the exhibition can be arranged as an incentive programme as well. Previous articleHelp Us Find New Europe’s Top Influencers!